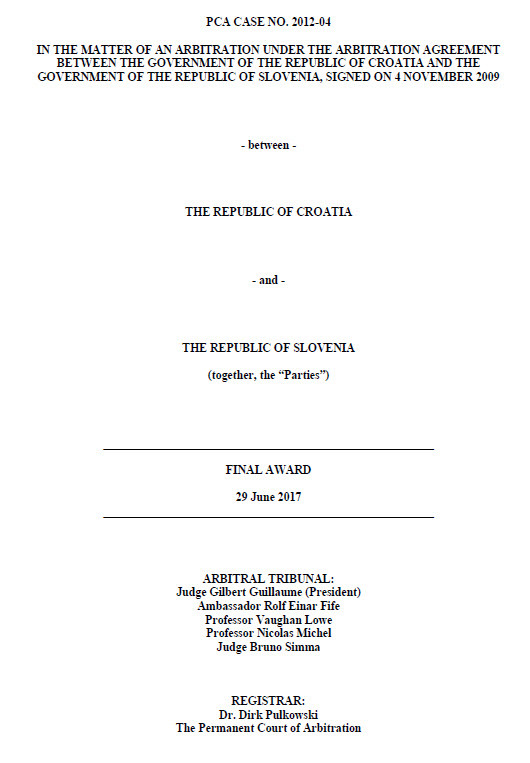 The long-awaited Final Award regarding the PCA arbitration between Slovenia and Croatia has finally been issued. It was rendered on 29 June 2017, ruling upon the border dispute between the Republic of Slovenia and the Republic of Croatia. The Arbitral Tribunal, presided by Judge Gilbert Guillaume, rendered its Final Award on the basis of an Arbitration Agreement between the Republic of Slovenia and the Republic of Croatia, signed on the 4 November 2009. The unanimous decision of the Arbitral Tribunal determined the disputed land and maritime border between Slovenia and Croatia and provided for Slovenia’s access to international waters by establishing a “Junction Area”. The junction is subject to a particular regime that differs from any of the regimes as defined by UNCLOS. After the breakup of Yugoslavia, Slovenia and Croatia both declared their independence in 1991, but the border between two ex-Yugoslav Republics remained disputed. Slovenia and Croatia both relied on different sources for the definitions of their land border in the disputed territories. For the maritime border, the countries did not have reference points as the maritime borders were not defined by the former Yugoslavia and had had the status of internal waters. The countries had attempted to resolve the dispute since independence, however, their efforts were unsuccessful. By 2009, the dispute became a significant obstacle to Croatia’s accession negotiations with the European Union. After initiatives and the facilitation of the European Commission, the parties negotiated the arbitration agreement that their respective prime ministers, Pahor and Kosor, signed on 4 November 2009. Article 4 provided that the tribunal shall apply the rules and principles of international to determine the maritime and land boundary. For the determination of the junction and its regime, the tribunal would apply the rules of international law, equity and the principle of good neighborly relations, in order to achieve a fair and just result by taking into account all relevant circumstances. The arbitral proceedings took an unexpected turn in the summer of 2015, when the Serbian and Croatian press revealed that the Slovenia-appointed arbitrator, Dr. Sekolec, had held communications with Slovenia’s agent. After the revelations, Dr. Sekolec resigned as arbitrator and, soon after his resignation, the Croatian-appointed arbitrator also resigned. Croatia notified the Arbitral Tribunal that it considered Slovenia to have violated the arbitration agreement and that it was therefore terminating the arbitration agreement. The Tribunal was reconstituted with appointments of new members by the President, Judge Guillaume. Croatia did not participate in the proceedings in front of the newly-constituted Arbitral Tribunal, however, and its representatives did not appear at the declaration of the Final Award in The Hague on 29 June 2017. The border at Piran Bay was not was not formally divided between the two Republics prior to the dissolution of Yugoslavia, and the two countries inherited no legal title from that time. The delimitation of the border in the Piran Bay was therefore made on the basis of the uti possidetis principle, where the Tribunal relied on effectivités – the effective exercise of territorial jurisdiction. The Tribunal took into account factors such as tourism development, concern for the marine ecosystem, research and police activities, the responsiveness of States in the event of accidents and concern regarding pollution. The most controversial issue in dispute was the delimitation of the maritime border in Piran Bay and establishing Slovenia’s access to international waters. Both parties’ arguments regarding the division of Piran Bay were based on Article 15 of the United Nations Convention on the Law of the Sea. Croatia advocated for the general rule of the median line to be applied for the border delimitation and Slovenia argued that rather than simply cutting Piran Bay in half, the Arbitral Tribunal should take heed that Slovenia holds a historical title to Piran Bay and that there were a number of geographic factors, as well as the economic and security interests of Slovenia, that should be taken into account as special circumstances that apply to Piran Bay. In its delimitation of the territorial sea, the tribunal accommodated the fundamental principle of natural prolongation and the effects of an incidental special feature from which an unjustifiable difference of treatment could result. In the Tribunal’s opinion, the equidistant line would cause an exaggerated “boxed-in” effect of Slovenia’s maritime zone and would constitute a special circumstance that should be taken into account. 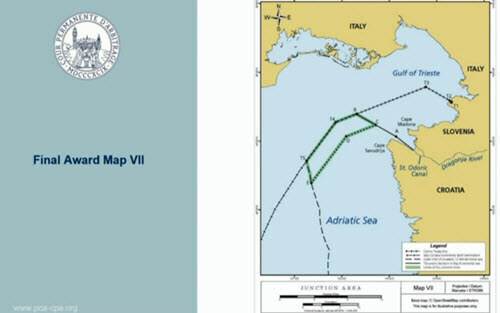 With respect to the junction of Slovenia to the high seas, the Tribunal established a Junction Area, where “junction” signifies a physical connection between the territorial sea of Slovenia and an area beyond the territorial seas of Croatia and Italy. The regime of the Junction Area preserves the integrity of Croatia’s territorial sea and Slovenia’s freedoms of communication between its territory and the high seas for the purposes of uninterrupted and uninterruptible access to and from Slovenia, including its territorial sea and its airspace. These freedoms apply to all ships and aircraft, civil and military, of all flags or States of registration, equally and without discrimination on grounds of nationality. Within the Junction Area, Croatia is reserved a right to prescribe and enforce certain laws and regulations for ships and aircraft in accordance with the UNCLOS. The Tribunal ruled that Croatia retains the right to respond to a request for assistance of Croatian authorities and also, exceptionally, that Croatia should retain the right to exercise in the Junction Area powers under the UNCLOS Article 221 in respect of maritime casualties. Alain Pellet, a distinguished French international arbitration lawyer, acting as lead counsel for Slovenia in front of the PCA, issued a comment that the decision was sufficiently clear in defining the word “junction”. He was specifically working on the maritime border and high seas access portion of argument and found the decision on Piran Bay to be a “pleasant surprise”. However, the Slovenian press is divided as to the question of whether the Junction Area regime provides for an effective access to the high seas. International law professors at Ljubljana’s Faculty of Law, including Dr. Škrk (acting as Slovenia’s Agent in front of the PCA) and Dr. Sancin, rendered a positive opinion on the junction regime, stating that it does establish a territorial and physical access to the high seas. The Croatian Prime Minister Plenković issued a statement that Croatia does not consider that the Final Award entails any legal consequences for Croatia and that the country does not expect that Slovenia will unilaterally enforce it. Both countries have exchanged diplomatic notes on the subject and the majority of the international community has urged them to respect the decision and enforce it. However, the US Embassies in Slovenia and Croatia, respectively, have stated that US will not take sides with respect to the Final Award. Germany, meanwhile, has taken a firm stance that international court decisions must be respected and will advocate for the enforcement of the Final Award. The full text of the Final Award and the arbitration agreement upon which it was based may be accessed below. Final Award, para. 37., 880. Arbitration Agreement between the Government of the Republic of Croatia and the Government of the Republic of Slovenia, Annex to the Final Award. Croatia terminated the agreement on the basis of Article 60 of the Vienna Convention. Tribunal concluded that it “has jurisdiction under the provisions of the Arbitration Agreement and Article 21, paragraph 1 of the PCA Optional Rules, and in conformity with Article 65 of the Vienna Convention, to decide whether Croatia, acting under Article 60 of the Convention ha[d] validly proposed to Slovenia to terminate the Arbitration Agreement and ha[d] validly ceased to apply it.” Final Award, paras. 198, 199. Uti possidetis principle governs the transformation of administrative borders into international boundaries following the dissolution of a State. Final Award, para. 256. Article 15 of the United Nations Convention on the Law: “Where the coasts of two States are opposite or adjacent to each other, neither of the two States is entitled, failing agreement between them to the contrary, to extend its territorial sea beyond the median line every point of which is equidistant from the nearest points on the baselines from which the breadth of the territorial seas of each of the two States is measured. The above provision does not apply, however, where it is necessary by reason of historic title or other special circumstances to delimit the territorial seas of the two States in a way which is at variance therewith”. A principle providing that the delimitations are to be effected “in such a way as to leave as much as possible to each Party all those parts of the continental shelf that constitute a natural prolongation of its land territory into and under the sea, without encroachment on the natural prolongation of the land territory of the other. Final Award, para. 1008.